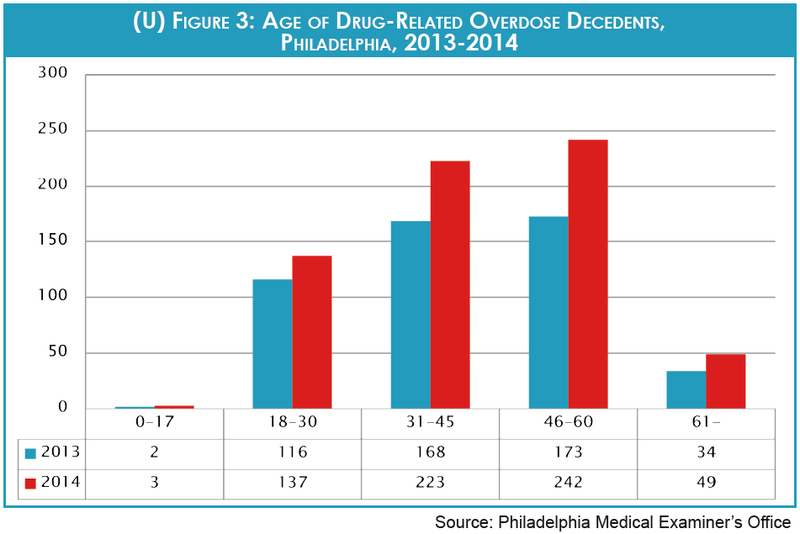 (U) The Drug Enforcement Administration (DEA) Philadelphia Field Division (PFD) Intelligence Program conducted an analysis of drug-related overdose deaths for the city of Philadelphia, Pennsylvania, for 2013 and 2014. Philadelphia is home to over 1.5 million residents and comprises part of the sixth largest Metropolitan Statistical Area (MSA) in the United States. (U) The abuse of illicit drugs, specifically heroin and cocaine, as well as the opioids fentanyl and oxycodone, has contributed to an increase in drug-related deaths in Philadelphia over the last decade. Specifically, drug-related overdose deaths in Philadelphia have risen 43 percent since 2009, with a corresponding 45 percent increase in heroin-positive toxicology test results. 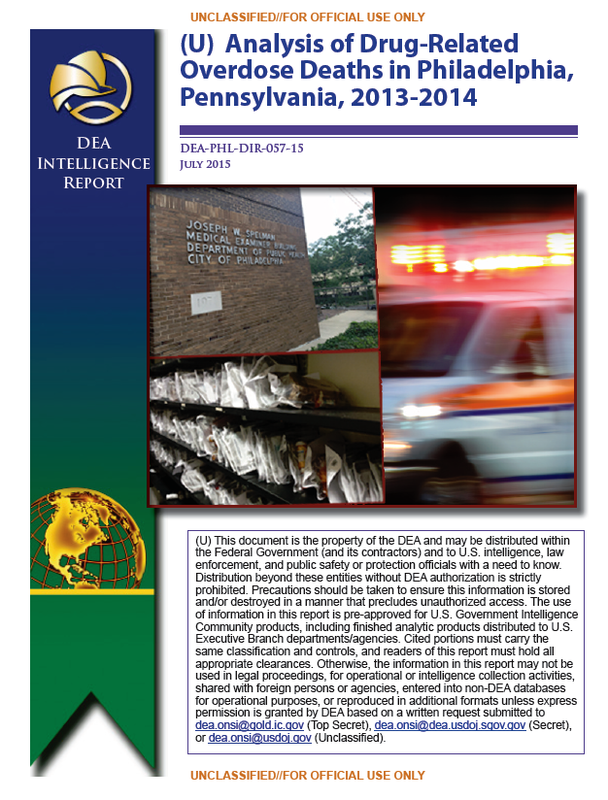 (U//FOUO) The PFD Intelligence Program periodically conducts assessments of the drug threats in Pennsylvania based on a variety of factors, to include: availability, threat to public health, community impact, attendant crime, enforcement activity, seizures, drug abuse and treatment statistics, drug-related death statistics, and propensity for abuse. Analysis of each of these areas, combined with investigative reporting, liaison, and open source data allows for a comprehensive overview of each drug area. For each of the previous five years, the primary drug threats in Philadelphia have been identified as heroin, pharmaceuticals (specifically opioids and benzodiazepines), and cocaine. (U) The PFD Intelligence Program maintains a relationship with the Philadelphia Medical Examiner’s Office (PMEO) through which historical and current information related to drug-related overdose deaths is shared, upon request. These requests are made in support of strategic intelligence collection to identify current and emerging trends in drug availability and abuse. 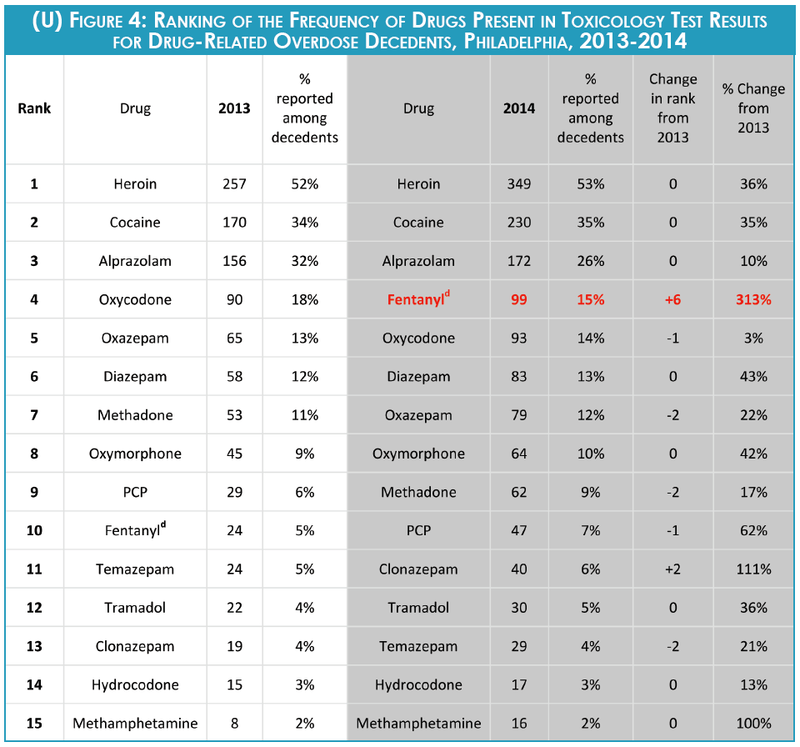 (U) The PFD requested drug-related overdose death data for 2013 and 2014 from the PMEO, to include data on decedents for which the primary or secondary cause of death was drug intoxication (overdose). Upon receipt of the data, analysis was conducted on gender, age, race, and drugs present in toxicology test results. 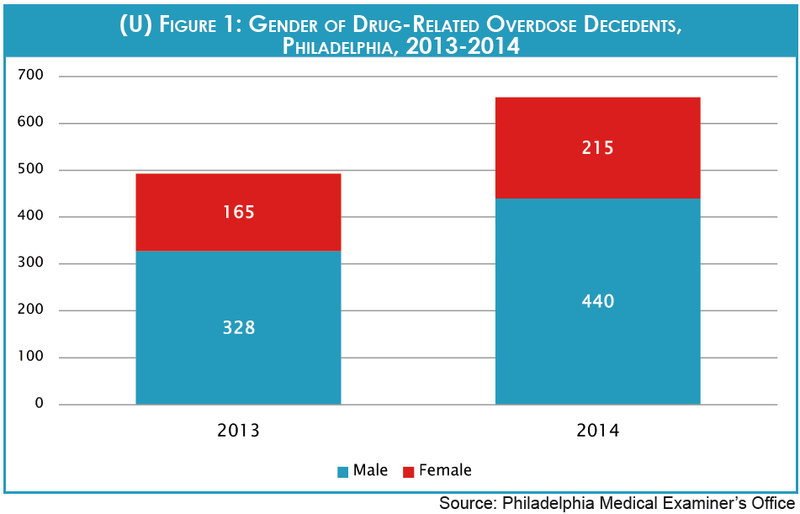 (U) The PMEO provided information on 493 and 655 decedents for 2013 and 2014, respectively; this data revealed a 33 percent increase in drug-related overdose deaths in Philadelphia from 2013 to 2014. (U) Males comprised 66 percent and 67 percent of total decedents in 2013 and 2014, respectively. The average age of decedents was 42 for both reviewed years, with the largest percentage in the 46-60 age group (35 percent in 2013 and 37 percent in 2014). (U) White (non-Hispanic) decedents were the largest percentage in both reviewed years (60 percent in 2013 and 56 percent in 2014), with African Americans reflecting 27 percent and 31 percent in 2013 and 2014, respectively, and Hispanics comprising 10 percent (2013) and 12 percent (2014). (U) Analysis revealed that 12 percent of the decedents in the 2013 data set resided outside of the city of Philadelphia at the time of their death; in 2014, this rate was 11 percent.